Dr. Stephan Ortner studied biology at the LFU Innsbruck and music at the Musikhochschule Innsbruck. Already in 1990 he started his first collaboration with the European Academy of Bozen/Bolzano (EURAC), in detail with the Institute of Alpine Environment. He dealt with his main research focus on the Alps and the Alpine convention also during his work as scientific collaborator of CIPRA (Commission Internationale pour la Protection des Alpes) in Munich. In 1992 Ortner became managing director of CIPRA Germany and as such he was in charge of establishing the Alpenforschungsinstitut in Garmisch-Partenkirchen. The newly-created institute was led by Ortner until 1996 when he became director of the EURAC in Bozen/Bolzano. The EURAC in Bozen is a private research centre. With some of its institutes covering natural sciences (centre for biomedicine, institute for renewable energy) it is an interesting future employer also for chemistry students. 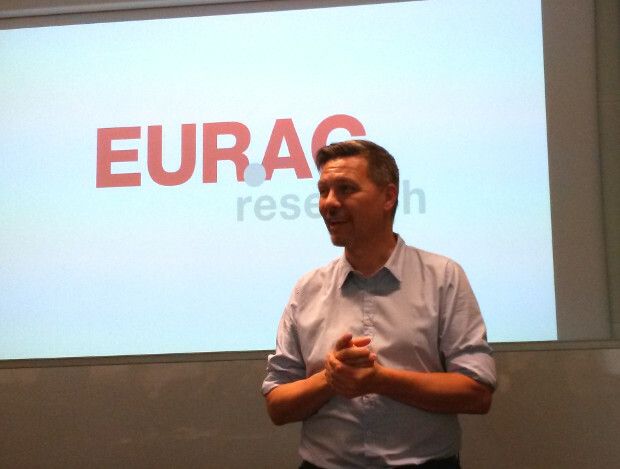 Dr. Ortner explained that they will find even more job offers at the EURAC in the near future because of additional capacities and joint projects (e. g. Innovation Parc of Bozen). His talk held on May 10th 2016 at the Centre of Chemistry and Biomedicine in Innsbruck offered rare insights into the practical and structural settings in a private research centre. 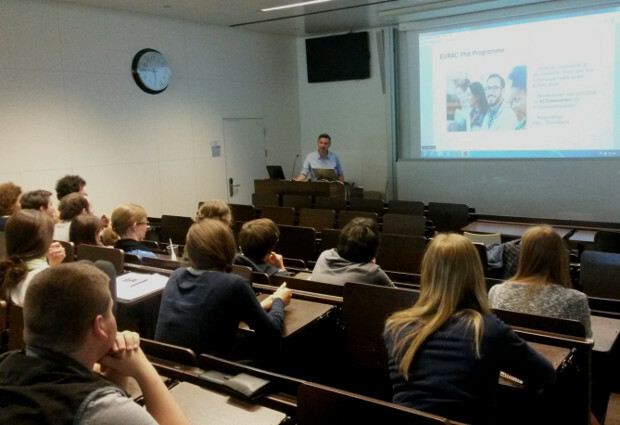 As expected from a talk of our "Talking Business" series Dr. Ortner gave a lot of information about career opportunities at the EURAC. He explained how to apply for a research position at the centre and pointed out that a remarkably high number of younger researchers are part of the staff. Special PhD programmes contribute to this fact, where students from over 20 partner universities acquire research results for their doctoral theses at the EURAC. Further information about the research centre, its research areas and career opportunities can be found on the web page of the institution: www.eurac.edu.